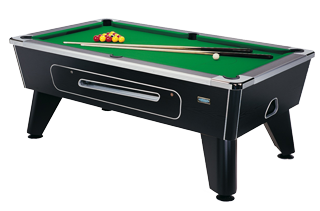 Hazelgrove Superleague have been manufacturing pool tables since the early eighties. If you have ever played a game of pool in the pub with friends then chances are you have played on a Superleague table. There have been numerous designs of table produced by Superleague over the years, the Diplomat, Continental, Trad and Imperial being just a few of them. The design was so good that many of them are still in use to this day. The Imperial table became the industry standard by which others were compared and it remains the companies flagship table. We believe that the Superleague brand is unrivalled at the price, offering a better playing experience, operating reliability, service life and resale value than those of our competitors. 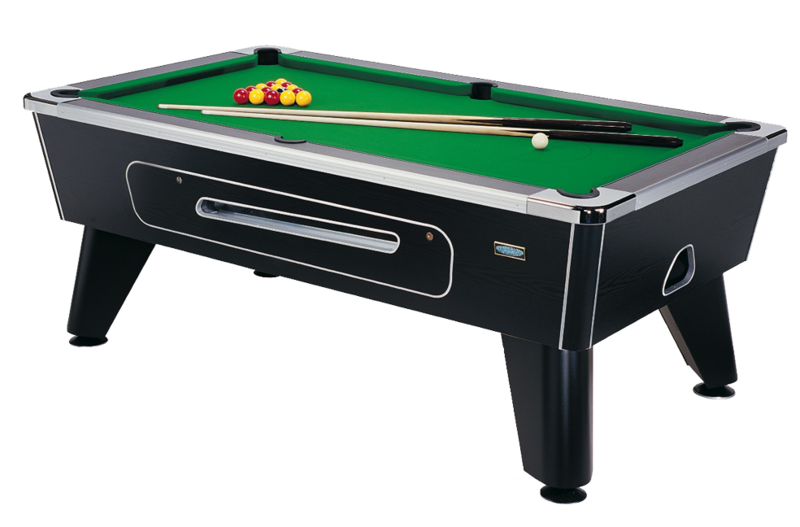 The reason for these claims can be attributed to the superior materials used in the construction of our tables, the renowned ball-handling mechanisms and superior slate levelling systems. 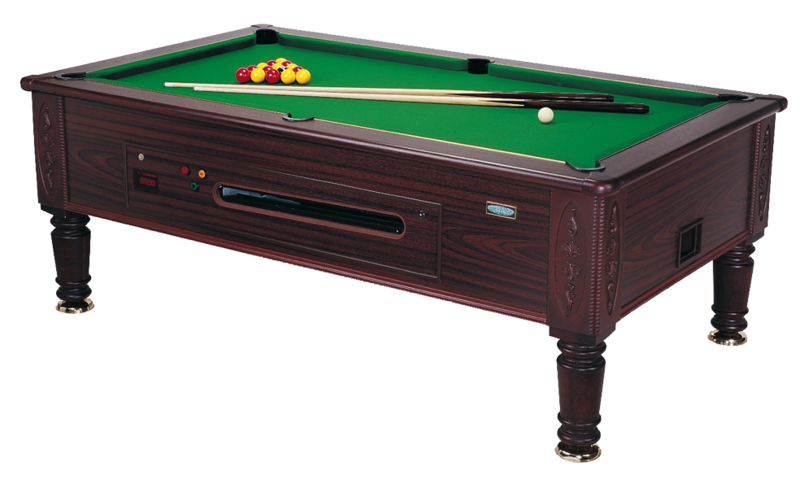 All pool table frames are constructed of high grade plywood, which is glued and screwed for rigidity. Plywood is much more durable than the MDF used by most of our competitors, and is far more likely to stand the stresses and strains of transportation and rough handling. Likewise, our top frames are steel braced at both corner and centre pockets, making the frame more rigid for better ball reaction and service life. The ball return mechanisms were designed in the 1980's and have proved to be so successful over the years that only minor refinements have ever been needed. All our tables come pre-levelled, using cold rolled steel slate support beams. They should only require the table levelling in relationship to the floor during installation. Please take the time to have a look around our website and don't forget to take a look at the new innovative Mk5 optima electronic coin operated ball drawer for maximizing multi coin operations. Superleague offers three types of table in two size formats. 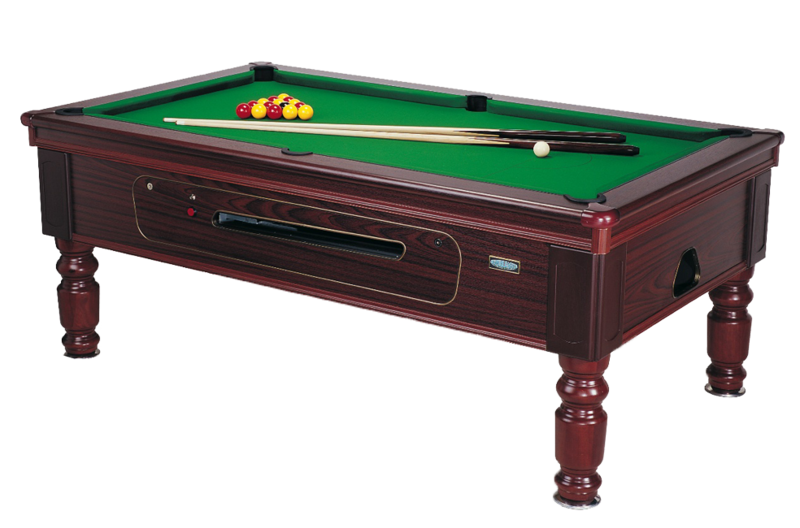 Each table comes supplied with two quality cues, a set of balls, Superleague triangle, freewheeler rack and chalk. Our hardwood cue rack and matching notice board can be supplied on request at extra cost. The Imperial is offered in six and seven foot versions and comes in mechanical and electronic drawer formats. It comes in a traditional furniture style in a choice of Rosewood (dark Mahogany) or Beech veneers with solid hardwood turned legs. 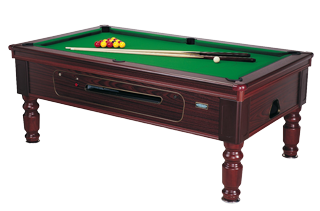 The Imperial was designed to be a table of tournament standard and is therefore only offered for domestic use in a freeplay version thus ensuring that the standard is not compromised from that of a commercial table. The leveling system on the Imperial table is designed for tournament play and offers much tighter control over slate leveling than standard tables. It is a deep sided table giving greater fall to the ball runs for faster ball return and hence less likelihood of ball entrapment. The seven foot Imperial has a larger slate and hence playing surface than most other brands, with an extra 1.5 inches on both the width and length of the slate. Lift off hinges fitted to the top frame make cushion fitting easier and rapid removal of the top fame reduces table weight for entry into those difficult sites. This table comes with a cash box surrounded by an additional metal sump for extra security. Each table comes supplied with two quality cues, a set of balls, Superleague triangle, freewheeler rack and chalk. Our hardwood cue rack and matching notice board can be supplied at extra cost on request. The table is supplied as standard with green West of England napped cloth but can be fitted with alternative colours and speed cloth if requested. A fitting charge for alternative colours may apply. The magnum is a eight degree sloping sided table reminiscent of the ealier Superleague tables. It comes in black ash with contrasting aluminium trim. Available in a six and seven foot version with both electronic and mechanical drawer formats. It is only available in a seven foot domestic version. This is offered in six and seven foot versions and comes in mechanical and electronic drawer formats as well as a domestic version for the home market. A traditional furniture style in a choice of Rosewood /dark Mahogany or Beech veneer with solid hardwood turned legs. 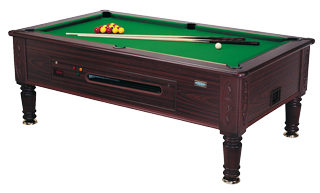 The Winchester is a shallower bodied table than the Imperial and comes fitted with the smaller seven foot slate. Fitted with strong internally locked cash box accessed from the ball drawer. Please click here to view our Parts Catalogue.